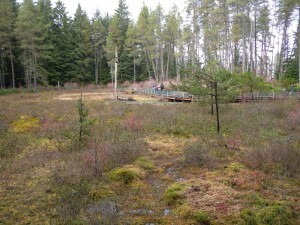 Camosun Bog is a small peatland sitting on the edge of Pacific Spirit Park (formerly Endowment Lands of the University of British Columbia). The formation of this wetland took thousands of years, achieving “bogdom” approximately 2,000 years ago – only a remnant remains; in less than a century, logging, fires, and more seriously, urban development changed the landscape. 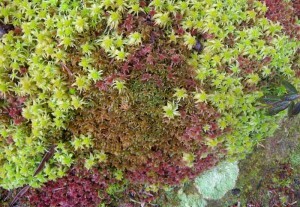 Altered hydrology had a detrimental impact on the unique bog plants, in fact very little Sphagnum persisted by 1985. Almost as soon as Pacific Spirit Park was established in 1990 the Greater Vancouver Regional District and the Vancouver Natural History Society took action and had 150 hemlock trees removed using helicopters. This of course did not solve the problem and indeed created new ones, but with the trees out of the way work could begin. 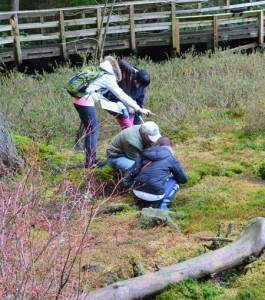 In 1995 the Camosun Bog Restoration Group was established. This dedicated group of volunteers, have worked tirelessly removing debris and re-establishing the wetland. 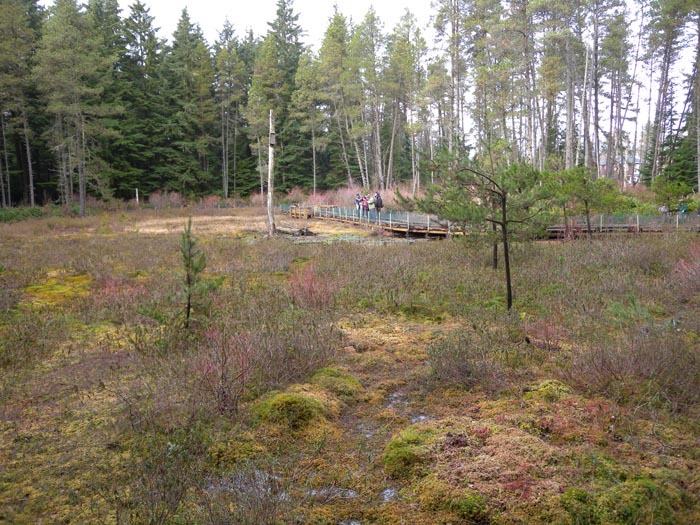 A combination of substrate removal to bare peat (lowering the water table) and various experiments on Sphagnum and peatland rehabilitation are successfully bringing this bog back to life. Today you can see it as a work in progress. A boardwalk was constructed around the perimeter offering views from all angles. You can see areas of well-established Sphagnum, recent transplants, sites being prepped for planting, as well as areas where invasives, such as Juncus and Dulichium, are in the process of being removed. Bog plants you can find include: numerous species of Sphagnum, cranberry (Vaccinium oxycoccus), Labrador tea (Rhododendron groenlandicum), sundew (Drosera rotundifolia), bog laurel (Kalmia microphylla), blueberry (Vaccinium myrtilloides, V. ovalifolium, V. uliginosum), shore pine (Pinus contorta), and cloudberry (Rubus chamaemorus). Hermansen, S. and G. Wynn. 2004 Reflections on the nature of an urban bog. Urban History Review, 34:1, pages 9 – 27.